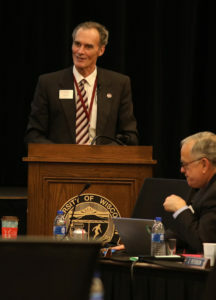 UW-La Crosse Chancellor Joe Gow addresses the Board of Regents during its December 2018 meeting, hosted by UW-La Crosse. LA CROSSE, Wis. – The University of Wisconsin System Board of Regents took decisive action by unanimously approving a pay plan that would provide UW System employees a three percent pay plan increase for each of the two fiscal years starting July 1. Regents also backed an identical pay plan for UW-Madison. “An investment in the University of Wisconsin System is an investment in Wisconsin, and making investments in the System means attracting, retaining and rewarding our high-quality faculty and staff,” said Regent President John Robert Behling. The proposal calls for full state funding of the increase. Typically, the state provides about 70 percent of the UW System pay increase with the rest being funded by tuition. However, with the current tuition freeze expected to continue through the 2019-21 biennium, institutions have limited ability to fund a significant share of any pay plan. “Full state funding of the pay plan means that investments are directed toward student success in the classroom,” said President Behling. Pay plan increases have trailed inflation and benchmark competitors in recent years. Faculty salaries, in particular, continue to lag behind their peers. The recommended pay plan increases would be delivered to UW System employees covered by the plan. The proposal is now sent to the Administrator of the Division of Personnel Management who will submit a proposal on UW System and UW-Madison employee pay to the Legislature’s Joint Committee on Employee Relations. Governor-elect and current Regent Tony Evers briefly addressed the Board, calling the UW System one of the most important “economic drivers and drivers of democracy” in Wisconsin. “It’s a value-added enterprise,” said Evers, who served 9½ years on the Board. He urged Regents to continue to be advocates for students and for the System. “You are here because you believe what you are doing for the University System is in the best interests of the state of Wisconsin. I thank you for that and look forward to working together with you as colleagues,” Evers said. UW-La Crosse Chancellor Joe Gow told Regents his campus is “sustaining excellence,” with record enrollment of 10,569 students and continued high rankings among peer institutions. Gow said UW-La Cross is implementing its strategic plan, which includes advancing transformative education, evidenced by collaborative faculty-student research; increasing community engagement, including through the “Hear Here” audio documentary project; achieving excellence through diversity and inclusion, as portrayed by the story of graduate Ryan Crain, a member of the Ho-Chunk Nation; and investing in its people. The Business and Finance Committee received the Annual Faculty Turnover Report from Shenita Brokenburr, UW System Senior Associate Vice President and Chief Human Resource Officer. Annual faculty turnover across the UW System for FY 2018 averaged 7.25% with a total of 434 faculty leaving UW employment during the year. Of these, 317 were tenured faculty and 117 were probationary (tenure track) faculty. 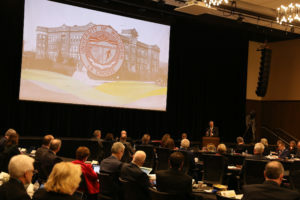 The Committee also received a report on compensation adjustments received by UW System faculty and staff outside any regular state-approved pay plan. A total of 30.61% of all staff received base adjustments (including those for promotions, title changes, and changes in duties) during fiscal year 2018. UW Chancellors reallocated approximately $40.1 million in FY2018 to fund these base adjustments. By comparison, reallocations of approximately $39.0 million were made for these purposes in fiscal year 2017. These reallocations represent 1.72% and 1.71% of the respective year’s salary base. The full 2018 Financial Report will be available online soon. Heard from UW System Vice President for Administration Rob Cramer, who provided a brief update on the UW System Shared Services Initiative. Karen Schmitt, Interim Vice President for Academic and Student Affairs, and Aaron Brower, Senior Associate Vice President, provided an update on the UW Colleges and UW-Extension Restructuring Initiative. Specifically, they discussed the transformation of the Division of Continuing Education, Outreach, and E-Learning (CEOEL), which now provides its programs and services under the UW System Administration, to the UW Extended Campus. Heard a Teacher Education Initiative presentation from two undergraduate students and two recent graduates of the UW-La Crosse Teacher Education Program, titled: “What is the Experience of Students and Graduates of UW System Schools and Colleges of Education? Introduced plans for a task force on teacher education, including exploring issues surrounding college affordability, enrollment and public engagement. The Capital Planning and Budget Committee heard a Building Condition Update from UW System staff who provided a status update to the building condition ratings reported annually by each institution for all Board of Regents owned buildings. Regents also received a status update on the development of a Geographic Information System resource and a demonstration of how this information is used for capital planning purposes. Heard two reports from UW System staff on a Semi-Annual Status Report on Leasing activity since last June, and the UW System Semi-Annual Status Report on UW Solely Managed Capital Projects that are underway at System institutions. The REDI Committee heard a presentation from Dr. Samantha Foley, Assistant Professor of Computer Science at UW-La Crosse, highlighting a WiSys-funded Web-Portal, designed to provide better understanding of interconnected systems. Dr. Foley discussed how this project bridges the gap between traditional computing environments and high-performance computing systems that are notoriously difficult to use. Heard an annual report from the Wisconsin Partnership Program. In 2000, Blue Cross and Blue Shield United of Wisconsin converted from a nonprofit service corporation to a stock insurance corporation. This conversion also created and funded the Wisconsin Partnership Program via the distribution of proceeds from the sale of stock to the University of Wisconsin School of Medicine and Public Health and the Medical College of Wisconsin. The Board of Regents, via the REDI committee, has oversight responsibilities for the Wisconsin Partnership Program’s annual reports, five-year plans and appointment of members to the Oversight Advisory Committee. The Audit Committee heard from Chief Audit Executive Lori Stortz with a high-level overview summarizing the results of recently issued audits. Heard an update on emergency planning and preparedness from Assistant Vice President of Administration Ruth Anderson, Chief Kristen Roman from UW-Madison police and ESC David LaWall. The Audit and Business and Finance Committees met together to discuss the 2018 Financial Report, which showed the UW System’s financial position remains strong as it implements 2020FWD. As required by the legislature, Plante Moran conducted the external audit on behalf of the entire UW System. Overall, the 2018 Annual Financial Report showed a decrease in equity (also called Total Net Position) of 0.3% or $17.4 million. The report shows an increase in cash and cash equivalents of $202.3 million, which is largely the result of bond proceeds held for forthcoming construction projects and the recent transfer of UW Trust Fund assets to the State of Wisconsin Investment Board (SWIB). As required by governmental accounting standards, the UW System’s share of earnings from the Wisconsin Retirement System are captured in the System’s financial statements and had a significant impact on the System’s financial position. The financial statements for 2018 and 2017 include three prior period adjustments of note. The largest of these relates to Library Holdings. As recommended by Plante Moran, to align with evolving industry standards the 2017 statement reflects a $962.3 million reduction in Net Investment in Capital Assets attributed to applying depreciation to UW System Library Holdings. See more photos from the December 6, 2018, meeting. 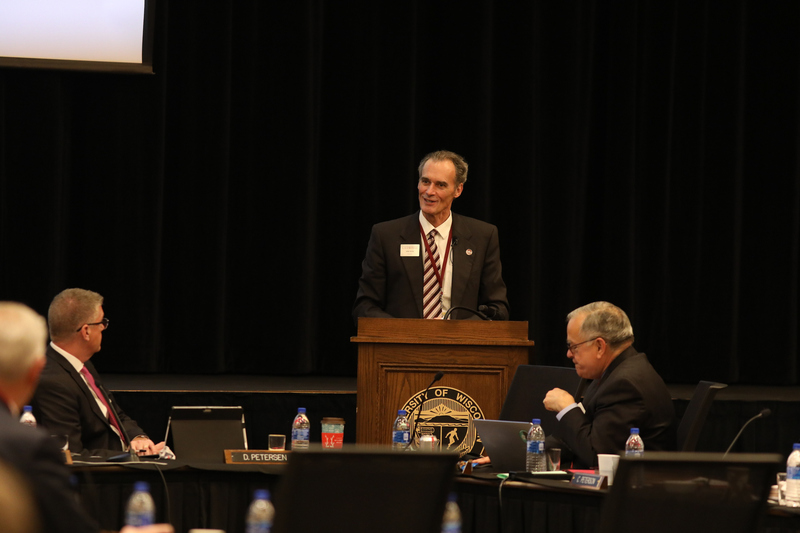 The Board of Regents resumes its meeting on Friday, Dec. 7, 2018, at UW-La Crosse.